"It's the Sicilian version of Ratatouille; trust me, it's good." 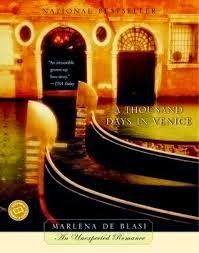 Our newest Cook the Books Club hostess, Debra of Eliot's Eats, picked a very sensual book for us to read, Marlena de Blasi's "A Thousand Days in Venice". It's a lushly written memoir about the American author's visit to Venice during which her future husband, Fernando, (aka The Venetian, the Man with the Blueberry Eyes, the Stranger, the Technicolor Anchovy, among other endearments) pronounces that she is the love that he has been waiting for his whole life. There are some language and cultural barriers to hurdle over, but Marlena accepts her fate and moves to Venice to become his bride, after first selling her share of her St. Louis, Missouri cafe and her opulently appointed new house. I enjoyed this tale very much. Marlena seems a larger-than-life character and has a bit of bravado, after suffering a tortuous first marriage and a "grim childhood, scattered here and there with the hideous". As a fellow romantic, I rooted for her to make things work with Fernando and sighed with pleasure when they did. It was not a shudderingly violent sort of love affair, but one that was quiet and sure: "Now all the doors are open, and there is a warm yellow light behind them." Ah. At Cook the Books, I and my fellow readers not only read and comment on our bimonthly foodie book selections, but we cook up a dish (sometimes a whole feast) that embodies our literary selection. While de Blasi's book provided some great recipes (Fresh Pasta with Roasted Walnut Sauce, Traditional Tuscan Tomato Porridge, Lemon Gelato with Vodka and Sparkling Wine, among others), I went to my late summer garden to gather up ingredients for a Caponata, that great eggplant concoction from Southern Italy. My harvest of tender white eggplants, parsley, tomatoes, garlic, onions, and basil just needed a few pantry ingredients to come together for a party dish to share with some friends. My host had not ever tried caponata and I tried to describe the recipe to him to his ever-furrowing brow. Finally, I just said "It's the Sicilian version of Ratatouille; trust me, it's good." and that did the trick. I took my bowl back home in a scraped-clean state. Give all of the vegetables a rough, but uniform chop. Heat olive oil in large frying pan. Add onions and garlic first and lightly cook 1-2 minutes. Add eggplant and celery and cook, stirring often, another 10 minutes, until soft. Remove vegetables from pan and reserve. In same pan, add tomatoes, vinegar and sugar and cook down about 10 minutes. Add olives and raisins and cook another 5 minutes. Add in reserved cooked vegetables and cook until everything is heated through. Season to taste with salt and pepper. Add parsley and basil and remove from heat. 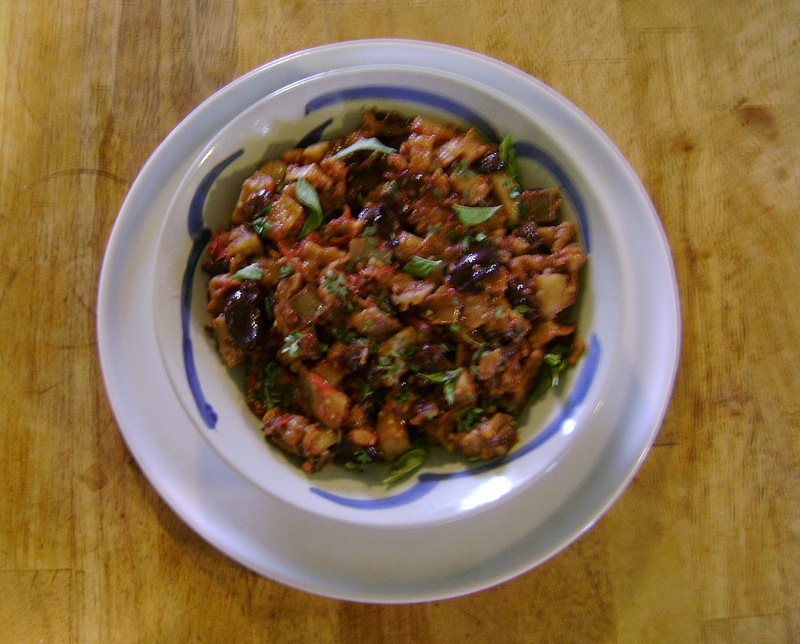 Caponata is great served at room temperature or chilled. It is wonderful on crackers or served in small endive or bell pepper "cups". Please join us in the next week back at Cook the Books for the complete roundup of all the posts and recipes celebrating A Thousand Days in Venice. Our next book selection is "That Old Ace in the Hole" by Annie Proulx, and new participants are always welcome. The deadline for the next round of Cook the Books is December 2, 2014, so there is plenty of time to buy or borrow Proulx's book and read and cook along with us.